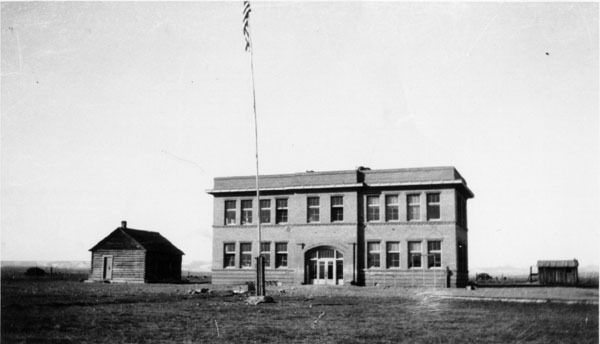 The large building pictured above was called the block school. It was a two story cement block building built at a cost of $11,000. It had four rooms. The upstairs housed the junior and senior high and the downstairs housed elementary grades. The first graduating class in 1915 included Ursula Tanner, Cornelia O'Neil and Ellen Swanstrom. 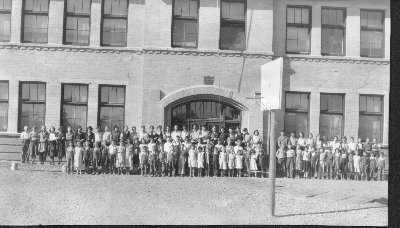 Later the log building, originally a school on North Piney, was put by the side for the first and second grades. Andrew Forbes was the plasterer and Andy Colling was the morter mixer and the hod carrier. The building was torn down in 1951 by James Bertram.